Darth Vader as seen in the Rogue One: A Star Wars Story film. Features his LED light-emitting device on the chest and familiar breathing sound! Anakin Skywalker's cape and vest are made with real fabrics! Figure includes 3 pairs of extra hands and Vader's lightsaber. 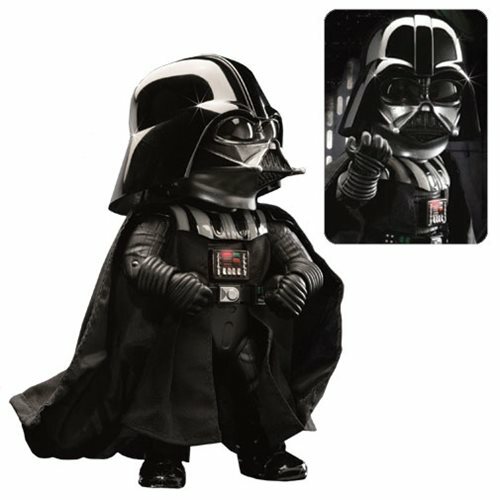 Egg-cellent Darth Vader figure! Beast Kingdom presents the Star Wars Rogue One Darth Vader Egg Attack Action Figure - Previews Exclusive. With his classic light-emitting device on the chest and the familiar breathing sound, Beast Kingdom shocks fans again with Anakin Skywalker's strong energy field! To faithfully represent the setting in the Rogue One: A Star Wars Story film, Anakin's cape and vest are made with real fabrics and metal wire and features 26 points of articulation. By coating the figure with different coloring techniques, Darth Vader is shown in different levels of luster. Three pairs of extra hands and his indispensable lightsaber are also included! This Star Wars Rogue One Darth Vader Egg Attack Action Figure - Previews Exclusive stands 6-inches tall. Ages 15 and up.